Metiria Turei has defeated Sue Bradford for the female co-leadership of the Green Party. The result was widely predicted as many Greens saw Bradford as tainted by her anti-smacking bill and as too far left. Bradford is a former meber of the Worker's Communist League and continues to run a marxist training school, the Kotare Research & Education Trust from her property near Wellsford. The Green's male co-leader Russel Norman is also far to the left-a former member of the marxist-leninist Australian Democratic Socialist Party, so most Greens were probably unwilling to push public acceptability too far. However, while Metiria Turei's image is not as tarnished as Sue Bradford's, she is still a serious radical in her own right. While Bradford and Norman represent the Green's dominant socialist wing, Turei comes from the party's militant anarchist wing. Metiria Turei came to activism in the early 1990s, a time of comparatively high unemployment and slow economic growth. After dropping out of Teachers Training College, Turei became active with the Palmerston North Unemployed Rights Centre-part of a nationwide network of similar organizations Te Roopu Rawakore o Aotearoa. Virtually all of Te Roopu’s constituent organizations were founded by members of either the pro-Chinese Workers Communist League, the pro-Soviet Socialist Unity Party or the pro-Albanian Communist Party of New Zealand. By the early 1990s, most of these organizations were on the decline and radical anarchists became more prominent. Nandor Tanczos was involved in Hamilton’s Te Roopu affiliated Beneficiaries Unemployed movement (BUM), while Christchurch anarchist Gaye Dyson headed the national organization in 1994. Dyson later when on to join the Green Party and served as Metiria Turei’s Parliamentary executive assistant, almost up to her death in 2004. In May 1990 Turei led Unemployed Workers' Centre protests outside local Labour and National Party rooms in Palmerston North over benefit cuts by placing piles of bones on office doorsteps. Other protests involved regularly including occupying Business Roundtable offices in Wellington and in Auckland, camping in merchant banker Michael Fay’s yard and swimming in his pool. In 1992 Meteria Turei became National Co-ordinator of Te Roopu Rawakore. The anarchism of the time is little understood. Most think of it as a punk movement involving little more than Mohawk haircuts, safety pins and spray painted anarchy symbols. In reality it was a radical leftist political movement, akin to communism, but contemptuous of socialist bureaucracy and hierarchy. Anarchists considered themselves “real” revolutionaries. Nandor Tanczos described what anarchism meant to him in a 17th July 1989 article in Waikato University student newspaper Nexus entitled "Anarchism and the Real World"
Anarcho syndicalism, to me, is organised anarchism, libertarian socialism. Rather than sit back and wait for "The revolution"...anarcho-syndicalism was born when anarchists got their hands dirty in the day-to-day class war-as agitators, educators and organisors. Anarchism is seen in practice as the most militant and practical section of the working class movement. By 1992 Metiria Turei was at Auckland University doing papers in Anthropology and Maori Studies, before moving on to Law. In the 1993 general election, Turei stood for the McGillycuddy Serious Party in the New Lynn electorate. She stood for the McGillicuddy’s again in 1999, after standing at number 4 on the Aoteoroa Legalise Cannabis Party list in 1996. While usually viewed as a joke party, the MgGillicuddy’s had a serious side, being run almost entirely by anarchists-though not too anti state to refuse government advertising funding when offered. Several prominent McGillicuddys went on join the Green Party including Nandor Tanczos’s Hamilton office manager Barry Bryant and party media laiason officer Mark Servian. Others including Ross Gardiner and Sam Buchanan went on to become leaders of the Wellington anarchist community. Metiria Turei went on to marry another former McGillicuddy- Worik Stanton. By 2001 Turei too was an ex McGillicuddy, standing as Green Party candidate for the Auckland mayoralty. By now she was a qualified lawyer and co-president of Te Hunga Roia Maori o Aoteoroa, the maori lawyers society. At the 2002 Green Party conference Turei put a remit forward calling for the Greens to endorse the ”maori” version of the Treaty Of Waitangi. In 2002 Metiria Turei entered Parliament on the Green Party list. She hadn’t become entirely respectable though-becoming a member of the Random Trollops, an anarcho-feminist performance troop and a regular at Auckland’s annual gay “Hero Parade”. I went to University cos I was 21 and didnt have to have UE. I found Anarchists and McGillicuddies and Tino Rangatiratanga and a group of women performers called the Random Trollops. And then I had my baby and realised that I would spend the rest of my life on the DPB if I didn't get a job. So I applied for law school and got in via a bridging course. And then relying heavily on the generosity and commitment of my friends and family I graduated. Most recent profiles, if they mention it at all. gloss over Turei’s anarchism as a past aberration, but there is little evidence that she has actually renounced her extremist views. Presumably the other anarchist “minister” was fellow Green MP Nandor Tanczos. In July 2007 an Australian Aboriginal Rights campaign partially run by a former Hamilton anarchist and Green Party Parliamentary staffer Rayna Fahey sought international support for “Kulin” land claims. Ongoing G20 Arrestees Solidarity Network, Radical Women, Resistance (youth wing of Russel Norman’s former Marxist party), Socialist Alliance, Socialist Alternative, International Socialist Organisation, Socialist Party, Communist Party of Australia, Maritime Union of Australia (communist controlled), Indigenous Social Justice Association — Sydney, Anarchist Media Institute. Rayna Fahey was later a strong supporter of the “Urewera 17”- the alliance of pakeha anarchists and maori radicals arrested in October 2007 for allegedly participating in “quasi-military” training camps in the Bay of Plenty back blocks..
Te Ata Tino Toa, Concious Collaborations, Wildcat and Socialist Worker all came out strongly in support of the jailed “terrorists.” The Aocafe website was temporarily closed down after police alleged it was used by those arrested to network and arrange meetings. Hone Harawira from the Maori Party and Keith Locke and Nandor Tanczos from the Greens were very vocal in defence of the arrested activists, as was Metiria Turei. 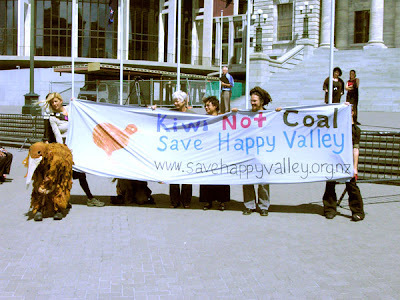 Turei’s connection to the Urewera 17 came through her close ties to radical environmental group Save Happy Valley Coalition (SHVC). Since its formation in 2004, the SHVC has cost power company Solid Energy many millions of dollars of by disrupting their coal mining activities in the West Coast's Happy Valley. The Save Happy Valley Coalition came together at a campout at Happy Valley in early April, 2004. A group of people from around the country travelled to Westport and made the three hour hike to Happy Valley to camp for a week in protest against the proposed mine. Working alongside other organisations like Buller Conservation Group, Te Runanga o Ngati Waewae, Forest & Bird, Greenpeace and the Green Party the Save Happy Valley Coalition aims to build awareness about the proposed coal mine at Happy Valley and the environmental issues surrounding coal mining, and to actively oppose the mine and coal-fuelled energy generation. Green Party members have worked SHVC from both inside and outside the organisation since day one. Metiria Turei has played a leading role in supporting the campaign. Protestors who plan to indefinitely occupy a precious natural South Island valley in a bid to stop it being turned into an open cast coal mine have the full support of the Green Party. Conservation Spokesperson Metiria Turei says the Party hopes that lots of people will get behind the Save Happy Valley Coalition when they move onto the site tomorrow. “It is scandalous that in this day and age we are still allowing companies to proceed with environmentally devastating open cast mining – especially when the company, Solid Energy, is a State Owned Enterprise…. “We applaud the Coalition for their courage to take this action and wish them all the best in their endeavours,” Mrs Turei says. Turei joined the occupation at Happy Valley for four days over Easter 2006 and tramped into the valley with Greens co-leader Russel Norman in early 2007. SHVC is essentially an alliance of Greens and anarchists. Wellington SHVC headquarters is the 128 Abel Smith Street, famously raided by police during the October 2007 “anti-terror” busts. 128 is also the home of the Wildcat Anarchist Collective, and the anarchist website, Indymedia. At least four members of the "Urewera 17" have links with both 128 Abel Smith Street and the Save Happy Valley campaign. The four include include Emily Bailey and her younger brother Tim/Ira Bailey, who was SHVC's campaign's spokesman for much of 2006 and Indymedia editorial collective member Omar Hamed. Another member of Indymedia editorial collective, well known anarchist Asher Goldman is also a leading SHVC activist and "Urewera 17" support campaigner. When the "anti terror" raids occurred on October 15th, police also tried to search two Christchurch houses including one occupied by SHVC spokeswoman Frances Mountier, but were denied entry because they had no warrant. The police claimed they were looking for a "person of interest"-believed to be Mountier’s flatmate and fellow SHVC activist Kristin Gillies. Turei was photographed holding an SHVC banner, with anarchist Val Morse (on left)-also later arrested in the October 2007 raids. Turei has used her parliamentary position to help SHVC in other ways. Maureen Howard, Dunedin Outreach Coordinator for Green MP Metiria Turei has been listed as Dunedin contact for SHVC. SHVC’s illegal occupation of Happy Valley and associated disruptive protests has cost state owned Solid Energy many millions of dollars. To counter this Solid Energy has called in police and hired a private security company Thompson & Clark. Metiria Turei has used her Parliamentary position to ask questions on police operational matters and Thompson & Clark, presumably for the benefit of SHVC. How many police officers were in attendance in the vicinity of Denniston, near Westport, to collect the names and addresses of Save Happy Valley supporters and others returning from the upper Waimangaroa Valley on Sunday 20 November? How many police officers in attendance in the vicinity of Denniston, near Westport, to collect the names and addresses of Save Happy Valley supporters and others returning from the upper Waimangaroa Valley on Sunday 20 November came from stations outside of Westport and from which stations did they come? Does he have a copy, or has he ever had or seen a copy, of any Thompson and Clark reports? Metiria Turei used her Parliamentary position to help her anarchist, lawbreaking friends. Isd such a person fit to lead a party that may one day hold influential Cabinet positions, or the balance of power in a future Parliament? If Turei is really as radical as you claim she is, I am really happy! Turie is most certainly opposes our police state and is someone that needs to be watched and documented as I believe she is a closet marxist who supports the rights of criminals and worst of all has empathy for the urewara terrorists. I'm happy for you too Cameron! Good on Metiria for being anti coal energy, and selling coal to China. Do u like NZ selling coal to Communist China Uncle Trev? Got any new info Trev? Looks like the same old rant. How much would You pay activists to provide their own profiles? SOE Solid Energy is state coal corporation, not a energy comany. Much of its profit and revenue comes from sending coal to China and India. Not good at all Trev! And cutting and pasting fronm your own previous writing is kinda boring don't you think? By the way, while it's clear that Solid Energy's hired security were unlawfully carrying out business activities on the conservation estate without a concession, what is it that makes camping on conservation land, as in the case of the SHVC occupation, illegal? Quite a rant there - Trev. Nothing new or unknown at all. You do realise you could have been something if you not wasted your youth hurling abuse at Lada drivers. Instead you have turned into a bitter envious angry old man. So sad really. Bitter?, BITTER?, B-I-T-T-E-R? &8*1@#%%** B-I-T-T-E-R? What are you on about man? You don't mention who Turei worked for as a lawyer, or for how long...? Not important? "what is it that makes camping on conservation land, as in the case of the SHVC occupation, illegal?" Why is no Trev answering that basic question? Has Turei ever been to Pakistan or Afghanistan before she began her jihad, that is the question. I saw her near Motueka once - it's almost the same thing. Trevor I think you should explore the McGillicuddy Serious party - militant anarchist connection. Good to see that there are at least a few kiwi parlimentarians who aren't rednecks. Good luck to Ms Turei - she sounds like exactly the sort of MP that New Zealand needs more of.